A couple that really loves each other, may still have a history of ups and downs, especially relationships susceptible to psychological and other influences. Marriage counselors will often hear, “It’s complex”, in reference to how the relationship is going. Historians of science and religion have come to see this too. John Hedley Brooke had a serious impact on scholarship, when he and his colleagues produced work that led to a new consensus in the scholarship. Brooke looked beyond the intellectual points to the sociological, political, and cultural factors involved. Dixon, Cantor, and Pumfrey in their work, Science and Religion: New Historical Perspectives, and Lindberg and Numbers, follow on from Brooke and developed further the idea that the complex relationship is contextualized, and displays diverse interactions based upon a number of influential, environmental and contextual factors. Therefore, people working out of the science or theology perspective will have conflicts with the other field, but these speak only to other influential factors being involved, and not necessarily to the reality of the relationship. If a specific theological field were invalid, then the conflicts would likely, over time, rise to the level of defeaters, or at least would display the trend towards the conflict model. If a specific theology were valid, there would almost certainly still be conflict, being closed-off from proof and open to the external factors on the people involved. But in contrast to the trend of invalid models, over time, the trend would show occasional conflicts, but an overall rise towards agreement and examples of mutually supporting each other. So while the conflicts between science and Christian theology may be the exception, these are very good opportunities to investigate to help decide if the conflicts are real and the predicted trend will be towards further conflict and invalidation of the source of knowledge, or only apparent conflicts brought on by the complex factors, and will predictably become examples of mutual support in the trend towards concordance. One aspect of the mutual support, are examples of seeming conflict that turned into supportive corrections, such as the aforementioned biblical correction of inaccurate historical claims (see section 3.2.4), and of scientific claims regarding the beginning and cause of the universe. Also, faulty biblical extrapolations have been corrected by scientific discoveries, such as in the case of the Galileo affair, in which Galileo himself said those opposing him simply based their position on an inaccurate interpretation/extrapolation. Notice in these cases, the conflict arose between the people involved and their personal interpretations of data from nature or extrapolations from scripture (going beyond what was actually stated), which is to be expected whenever people are involved. You own land, which a neighbor’s herd of sheep crosses over and grazes on periodically. You ask if you can see this herd, and know previously this neighbor is honest and reliable, and she says her herd always stays together and only consists of eight sheep. As you approach where the herd is currently grazing, you see ten sheep. Apparent conflict exists between the two sources of information, your observation and the word of your neighbor. But then again, as you move in closer you notice two of the sheep are running in circles around the rest, and closer still, you realize those two are actually sheep dogs. Apparent conflict resolved by mutual support provided by one field to the other. Let’s consider several common, current antagonistic subjects. First, many in science, and many who accept Christian theology, think that the Big Bang models of the beginning of the universe conflict with biblical theology. This is very interesting considering the history of thought concerning the beginning of the universe, covered in section 3.2.3, involved scientists recognizing the Big Bang models were “scientific Genesis”, while the real conflict was between those who believed the universe was eternal and the discoveries of modern science. Yet, now many who accept Christian theology claim the Earth and Universe must be relatively young, around 10,000 years old, compared to the 4.5 billion and almost 14 billion year age science provides for the Earth and Universe respectively. These dates certainly conflict. However, as noted earlier, areas of conflict are good opportunities to test the relationship model and determine if it is an example of the apparent conflict, which will occur in valid fields of study with incomplete knowledge and susceptible viewers of that knowledge, or an example of real conflict, which over time will grow in support and number and trend toward the conflict models. The age of the Earth example is apparent conflict, and an excellent example of symbiosis between science and theology. Biblical theology accumulates bad interpretation or extrapolation leftovers over time, such as an idea promoted by a bishop in the 17th century that one could use genealogies in the Bible to determine the age of the Earth. Bishop Ussher even declared the time of day creation began, which should have waved the red flag warning of something that needs to be checked. Instead the idea was liked by enough, or the right people, to be added as a commentary in the King James Bible, which many people then took as established fact, instead of following the biblical command to “examine everything carefully” concerning things being taught, and realizing the claim was based on five assumptions, which are all easily proven false. Therefore, there is no age of the Earth given, nor any way to determine the age without serious and unsupported steps beyond what the Bible provides. There are actually five assumptions that must all be correct in order to extrapolate a date with reasonable accuracy, and all five assumptions are mistaken. This faulty extrapolation polluted Christian theology, and like the clownfish which cleans up leftover waste on sea anemones, the conflict with science has led many in Christian theology to re-evaluate and discard the extrapolation. Many still accept the young earth idea, but as science and Christian theology advance the knowledge bases further, the accurate view of reality will continue to be made clear. Richard Dawkins and Daniel Dennett claim evolution is unguided, so there is an apparent conflict with any theology claiming God’s guidance was involved. But is this conflict just apparent, or is it real? If you read Dawkins’ The Blind Watchmaker, where he makes this claim, check how he tries to defend the claim. Dawkins only gives support to show that it is not impossible, or not astronomically improbable that natural selection could lead to complex biological features, but no evidence showing arrival at the life we have was not guided, as science does not even have the tools to determine if God was involved or not. Dawkins also ignores the good arguments for intelligent guidance of the process. So Dawkins and Dennett’s claim – that it all happened by unguided process – is mistaken. The claim is simply philosophical gloss added onto the science involved with evolution. Even when considering amazing work in the origin of life from non-life, at every end we find examples of proof-in-principle, meaning it is shown that certain building blocks or steps in the origin of life are possible, but not that guidance was not also involved. This was publicly highlighted at the international ISSOL conference in 2002 on the origin of life. Biochemist and attendee, Fuz Rana, recalled that after a presentation by James Ferris, where Ferris triumphantly declared that clays in the environment were shown, by his team, to be able to provide an important step in the origin of life, a top-level origin of life researcher, Robert Shapiro, stunned the audience during the question-and-answer period by dismissing the team’s decades worth of work as offering little insight into chemical evolution, and instead provided elegant proof of intelligent design! Think about it: Ferris’ team, with massive expenditure of the brightest minds in the field, money, top-level equipment, and voluminous processes required to produce, in a precisely controlled lab, the results sought, showed how an important step could have happened. What follows from that? That the origin of life did happen like that, and without intelligent guidance – of course not. Shapiro realized that whatever led to the actual, full origin of life from non-life, must have been more intelligent and better funded than the Ferris team! Results in the diverse areas of study in the origin of life research have similar findings: proof-in-principle, but all reached with massive intelligence and investment involved, and absolutely no evidence that intelligent guidance was not involved. Those who declare they don’t need to believe in God because of evolution, or they don’t believe in evolution because they believe in God, are simply making a false dichotomy, and display a lack of understanding of the concepts involved. It is not a zero-sum game, so they are making “Much to-do about nothing”, which was the title of the talk I gave on “Darwin Day” at the University of Michigan. While there have been theologians and Christians since Darwin’s time that were fine with evolution being the method God used, many other Christians have had a problem with evolution, yet there have always been Christians on both sides of the issue because while the Bible notes God did perform special acts in creation, it doesn’t preclude evolution. If there were, then, at most, inerrancy would be in question, but none of the support provided for the biblical model would be, as that verification exists independently. And as far as science, there is nothing in the science circle, or in the theories or evidence of evolution demonstrating that the process precludes any guidance. Those who claim evolution does preclude any special guidance have stepped outside of the science circle because such a claim is a philosophical add-on, and not something shown by science. As Alvin Platinga elucidates in his book, Where the Conflict Really Lies: Science, Religion, and Naturalism (2011), ask a person making such a claim: “How do you know that there is no guidance? How could you possibly determine that?” Such a claim is philosophical gloss, as science is incapable of determining no intelligent guidance was involved in perhaps: fine-tuning the initial conditions, preserving specific populations or gene expressions over others, increasing the probabilities involved with certain favored mutations, or even special one-time acts. Another serious area of conflict is found in evolutionary psychology. Some writings in this field of study have claimed that beliefs in God are simply evolutionary responses to lack of control and fear felt, or like Freud thought, for want of a father figure that is strong and benevolent. There is no conflict so far, as maybe such an instinct has evolved, and if God does exist, then maybe this is one mechanism used to help us accept and trust him. When someone tries to add to the claim that this belief in God is only caused by evolution, and there is no actual God to believe in, then there is a conflict with theology. However, again this is only an apparent conflict, as again, such a claim is only a philosophical add-on, without evidence. The evolutionary psychologist has to step outside of the science circle (as the science circle does not have the radius to include disproof of God, only some specific theological claims) and into the philosophy circle to make such a claim. If one turns on their philosophy cam, then they will be enlightened to the fact that such a claim is mistaken. Even if such belief in God were partially, or entirely caused by evolutionary means, it simply does not follow that God does not exist, as that has to be determined by the evidence in all applicable fields of study. Evolutionary psychology is not applicable as it does not have the tools to gain evidence in whether God exists or not, the most it could do is if it were shown that no God exists, then evolutionary psychology could show how such a false belief arose. One more subject of primary discord, miraculous events and supernatural entities, could be a defeater to most, if not all theologies, if science showed that miracles are impossible and the supernatural does not exist. Then again, these topics are covered here because they are samples of only superficial conflict. Some have argued that miraculous events are not part of reality because they would be violating fixed natural laws as uncovered in the science circle. The question ultimately goes back to whether there is an intelligent cause that created the universe out of nothing. If so, then do you think any miraculous event after that would be a problem? It would be like asking a person who could build a car from the ground-up if that person was able to change the spark plugs. But when addressing the conflict directly, each of these natural laws, which describe how things act in nature, is only applicable to a closed system. Those claiming the impossibility of violating natural laws of science are assuming without scientific evidence or backing (actually against the evidence as we shall soon see) that the natural universe is entirely and always a closed system. Natural laws do not say anything about a situation when something outside the natural system interacts with it, and since science does not support the assumption of a naturally closed system, nothing in science goes against miraculous events because natural laws would not be violated. Science could be used to demonstrate that a miraculous event would be beyond our typical experience and exceedingly rare – but that is the point – for a theology to establish itself as having a source beyond humanity would require something beyond what humanity can provide for verification. Some may argue that is true for classical physics, but what about quantum mechanics? Platinga covers this topic well as he correctly notes that events in the quantum world aren’t fixed in the same way as classical mechanics, but instead have a probability of occurring this way or that, and in that probability is significant room for an intelligent agent to guide or utilize the probabilities to produce events that are otherwise miraculous (occurring even against massive odds against it, or even if phenomenally rare). There is a probability, which is exceedingly small but can be calculated, that all the matter and energy in a room become oriented in a way that causes a small volume around a person to become a temperature that would freeze the person solid in an instant. While thankfully this is unlikely enough to never need worry about it, it is possible in the quantum understanding. Again, the only way to rule out miracles would be to assume at the start that theism is not true, which is not anywhere in the realm of science to determine. Similarly, while the belief that science only studies the natural world may work as a restrictive, but generally true characteristic, the theory of naturalism or materialism, that the physical matter and energy and space and time of our universe is all there is, was, or ever will be (as Carl Sagan famously put it) – has already been proven false. By some of the most amazing discoveries in modern science, we have found that the entire universe, and all material and nature that makes up the universe, had a beginning, and is therefore contingent, or dependent on something beyond itself for its existence. If the cause is outside of, or beyond nature, that is supernatural, or hyper-natural if one doesn’t like the other associations with the word supernatural, Either way, we know that the cause of the universe is beyond nature, so claiming supernatural entities do not exist, not only is outside of science’s ability to prove, but also comes with scientific support. In the examples regarding the age of the universe, evolution, evolutionary psychology, miracles and the supernatural, once one removes the unsupported, philosophical add-on claims regarding the non-existence of God, the conflict is shown to be only apparent and caused by faulty reasoning by the people making such an ontological claim. So conflicts do exist, and there are other examples, but as was the case in even the most noted area of disagreement, the conflicts are apparent. And while there may be some conflicts that cannot be resolved, when one looks at the trend through time, it is reasonable to expect that with further knowledge these too will be resolved into the trend toward concordance. Yet more will arise as the relationship is complex. The complex-contextual model does take into account the relevance of other factors, and does explain why we have both concordance and some conflict. Nevertheless, this model, like NOMA and COMA, has restricted applicability. The complexity/contextual models apply to events in the history of the interactions between science and theology, but do not describe the reality of the relationship between these two sources. The reality of the relationship is determined by the validity of the two sources, and if these sources interact. This was recognized by Dixon, Cantor, and Pumphrey in noting: “the personal dimensions of both scientific and religious activities ought to be taken more seriously. There is a sense in which we need to read abstract discussions of theology and science more as personal statements than as assertions about the relationship between two independent systems of thought.” In other words, personal statements are influenced by the influential factors those authors discussed previously, which leads to the complex and contextual history, yet these personal statements do not speak to the actual relationship between the two independent sources of knowledge. If the two sources are valid, and if these sources interact, then both sources will be in agreement with the reality provided by each – as each is viewing the same reality – but until all the knowledge is in, and humanity is free of external-influential factors (i.e., cultural, political, psychological), there may be apparent conflict, or confrontation between the people involved. So the history, or series of specific events in the interactions, can be described by the complexity/contextual models. Yet, regardless of the history, whether it be all conflict, or all agreement, or a mixture (which is most likely, and is what we see), the reality of the relationship between two valid sources of knowledge does not change. And it is the reality of the relationship that we want most to know, because that determines what theology is valid and worthy of founding our thoughts, actions, responses, goals, priorities, and direction in life upon. While very useful in explaining why specific times show conflict and other times concord between science and theology, complex/contextual theories do not address what the actual relationship is between science and specific theologies, and therefore, cannot explain one of the most significant pieces of evidence in the relationship – trend-lines. While the scholarship appears to diverge into the full range of possibilities, when recognizing accurate points and restricted applicability in each proffered path, a clear direction emerges to a singular reality of the interaction. The flowchart began by assuming for the moment that science and a specific theology (or any two sources of knowledge) are valid. Next, it was shown that science and theology do interact, therefore NOMA is a false model. Because we do not have complete knowledge, neither field allows proof, and external-influential factors are involved, the two sources will not necessarily be in complete agreement where they intersect, and in fact will likely show concord and conflict in different contexts. COMA doesn’t apply. While the history may be complex, if both fields are valid, then the history of interactions conform to a trend over time – toward mutual support and agreement in a symbiotic relationship – which would be the reality of the relationship and is entirely described by the SOMA model. The complex/contextual models are not capable of explaining either the trend, or the actual relationship between the two sources of knowledge. SOMA incorporates or explains the accurate aspects of each alternative model, and extends the explanatory scope and power to be applicable to the full and actual relationship between science and specific theologies. This model is a predictive one, which means the reader does not have to rely on what this paper has gone-on about to this point, and can simply allow discoveries over time to either support or invalidate the SOMA model. Predictions one through three have been discussed, but the remaining predictions could be detailed further. As far as prediction three, the relationship, being complex, could swing to seemingly total conflict, or total concord, but it seems unlikely. Most likely would be that emotional, social, and cultural influences will push for both discord and concord in different people, at different times, leading the relationship to appear to have conflict and concord regardless of what whether there is true contradiction or agreement. Prediction four entails the symbiotic nature of the relationship, which means that even if both fields are valid, being in a complex relationship will bring conflict, thereby creating an environment where each field of study is in a position to do things for the other field that each cannot do for itself (such as one field validating data in the other, correcting bad interpretations of data or extrapolations of the other, etc.). William Lane Craig provided a good summary, along with examples, in his online article: What is the Relation between Science and Christianity. Some of the examples will be presented below as they differ from previous ones used in this paper. Fazale Rana, Creating Life in the Lab, (Grand Rapids, MI: Baker Books, 2011), 154-6. Alvin, Platinga, Where the Conflict Really Lies: Science, Religion, and Naturalism (2011). Thomas Dixon, Geoffrey Cantor, and Stephen Pumphrey, Science and Religion: New Historical Perspectives, Cambridge University Press (2010), 41. William Lane Craig, “What is the Relation between Science and Christianity”, Reasonable Faith, <http://www.reasonablefaith.org/what-is-the-relation-between-science-and-religion> (2014). 4a. Religion furnishes the conceptual framework in which science can flourish. 4b. Science can both falsify and verify claims of religion. 4c. Multiple layers of checks add reliability to a field, and extends the overall circle of knowledge. 4d. Religion can help to adjudicate between scientific theories. 4e. Science can establish a premise in an argument for a conclusion having religious significance. The clownfish and the sea anemone provide a biological example of symbiosis. The clownfish swims within the sea anemone without being stung, which provides protection from predators, which do get stung, and simultaneously create water circulation beneficial to the anemone. The clownfish also cleans away fish and algae remains within the anemone, which again is mutually beneficial. Similarly theology tends to accumulate bad interpretations of data or extrapolation leftovers over time (as is also true of science), and the other field, can expose and even help clear away some of this worthless accumulation. A valid theology, like the clownfish, can interact within the science circle without getting actually “stung”, while contradictory theologies can be damaged or even ended, when interacting within the science circle. Each field can also provide food (for thought) that stimulates or compliments the other field, and promotes the circulation of ideas. Science is not something that is natural to mankind. As science writer Loren Eiseley has emphasized, science is “an invented cultural institution” which requires a “unique soil” in order to flourish. Although glimmerings of science appeared among the ancient Greeks and Chinese, modern science is the child of European civilization. Why is this so? It is due to the unique contribution of the Christian faith to Western culture. As Eiseley states, “it is the Christian world which finally gave birth in a clear, articulate fashion to the experimental method of science itself.” In contrast to pantheistic or animistic religions, Christianity does not view the world as divine or as indwelt by spirits, but rather as the natural product of a transcendent Creator who designed and brought it into being. Thus, the world is a rational place which is open to exploration and discovery. Furthermore, the whole scientific enterprise is based on certain assumptions which cannot be proved scientifically, but which are guaranteed by the Christian world view; for example: the laws of logic, the orderly nature of the external world, the reliability of our cognitive faculties in knowing the world, and the objectivity of the moral values used in science. I want to emphasize that science could not even exist without these assumptions, and yet these assumptions cannot be proved scientifically. They are philosophical assumptions which, interestingly, are part and parcel of a Christian world view. 4b. Science can both falsify and verify claims of religion. This is important because people often are more drawn to what they want to believe, whether or not it is founded on truth. Combined with that psychological influence, humanity has vast imagination, therefore, science is very useful as it can impose limits of reality onto the overgrowth of imagination beyond what is based on truth. Here is a bold prediction: it is possible, but not necessarily the case, that science can even support the claim that there is a divine authority as the source a specific theology draws upon. Again, “proof” will not be reached, but when combining what science, history and a specific theology offers on a subject(s), it is possible that the most reasonable explanation will be that there is a divine authority, or at least an intelligent agent beyond humanity involved. Whether this is the case is another opportunity for further study, yet we have already covered something significant with the predictions the biblical model made concerning specifics about the beginning and cause of the universe. If one does not believe the biblical knowledge is beyond humanity’s ability to produce, then that person should be able to provide other comparable examples throughout all of human history, of anything ever produced by man, covering a handful (and there are more that can be added) of clear, specific predictions, made thousands of years in advance of modern science, in clear contradiction with all contemporary and current competitor theories, and then only be proven accurate by modern science discoveries over three-thousand years later. If there is not another example that reaches such a level, then this is at least absolutely unique, and worthy of further study. 4c. Multiple layers of checks add reliability to a field, and extends the overall circle of knowledge. Providing independent checks from other sources of knowledge is obviously useful in building the reliability of something, which one source brings into its circle of knowledge. Furthermore, our overall circle of knowledge, which is a combination of all fields of study, is expanded by each valid field. As noted previously, if one wants to learn quantum mechanics, theology is not the place to look. What may be less obvious to some is how theology expands the view of what someone in the science circle is restricted from viewing. Craig provides a common reflection from physicist David Park, “As to why there is spacetime, that appears to be a perfectly good scientific question, but nobody knows how to answer it.” Why is there something rather than nothing? Such a question arises naturally at the edge of the scientific circle, yet answers lie beyond. That is frustrating to Park as a watchman, the science cam just doesn’t provide a good view in that area of reality, yet the same theology cam that views the beginning cooperatively with science, also extends into that area science cannot. Theists typically accept a God that is a necessary being, the uncaused, first cause, whose non-existence is not possible, and who created the contingent space, time, matter and energy of our universe. Science and philosophy have anticipated such an uncaused cause, but science had just assumed it was the universe itself. Now that the universe has been shown to have a beginning, and therefore is contingent or dependent upon something else, the theist has the explanatory resources to provide Park and other watchmen a potential view of the ultimate explanation. 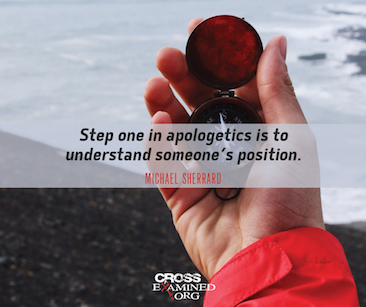 A valid theology can also provide the same benefit to other valid areas of study. For example, philosophy can provide that there is no objective morality without a transcendent authority, and theology can provide support for the reality of that authoritative grounding. Political views set down in the Declaration of Independence hold that: “We hold these truths to be self-evident, that all men are created equal, that they are endowed by their Creator with certain unalienable Rights . . .” Theology provides the grounding or basis for this political stance, because if there is no Creator, then there are no inherent, unalienable rights, as without a transcendent authority, “rights” just become subjective opinions of people, and the King of England had a different opinion at that time. 4d. Religion can help to adjudicate between scientific theories. Craig writes of this benefit, and while I think it is true, such adjudication certainly wouldn’t carry much weight until the specific theology establishes itself as a valid and productive source. For example, when most accepted that the universe had always existed, and someone brought the idea of a beginning to Sir Frederick Hoyle, it is not entirely surprising he ridiculed it as “scientific Genesis.” Unless Hoyle did studies of biblical theology, he wouldn’t be aware of other areas where biblical statements regarding the natural world demonstrate accuracy. However, after the scientific findings regarding the beginning, properties of the cause, and fine-tuning of the universe have been made public, the biblical model has warrant, and therefore weight in possibly adjudicating between other theories in science. Craig provides a specific example in two possible ways scientists can interpret the mathematics in the Special Theory of Relativity. Craig notes: “The Einsteinian and the Lorentzian interpretations are empirically equivalent; there is no experiment you could perform to decide between them. But I want to argue that if God exists, then Lorentz was right.” And then Craig provides the argument from theology and applies it to the science discussion to augment one theory over another. Craig chose to use “religion” as opposed to my choice of “theology”, which in this case is warranted as “religion” may be defined as the organization and activity people place around a theology, and as such, is involved in the mutually supportive examples. Loren Eiseley, “Francis Bacon,” in The Horizon Book of Makers of Modern Thought (New York: American Heritage Publishing, 1972), 95-96, as cited in Craig. Loren Eiseley, Darwin’s Century (Garden City, N. Y.: Doubleday, 1958), p. 62. I am indebted for the Eiseley references to Nancy Pearcy and Charles Thaxton, The Soul of Science (Wheaton, Ill.: Crossway Books, 1994), as cited in Craig. John Barrow and Frank Tipler, The Anthropic Cosmological Principle (Oxford: Clarendon Press, 1986), 442, as cited in Craig. David Park, The Image of Eternity (Amherst: University of Massachusetts Press, 1980), 84, as cited in Craig. Craig added: “Actually, this statement bears qualification; for as a result of the Aspect experiments verifying the predictions of quantum mechanics with respect to Bell’s Theorem, we now have substantial empirical grounds for affirming relations of absolute simultaneity between distant events, thus vindicating the Lorentzian interpretation. Premise 1. Everything that begins to exist has a transcendent cause. Premise 2. The universe began to exist. Conclusion. Therefore, the universe has a transcendent cause. Premise two is supported by modern science discoveries of the beginning of the universe. Premise 1. The fine-tuning of the universe is the result of necessity, chance, or design. Premise 2. It is not the result of necessity or chance. Conclusion. Therefore, it is the result of design. Premise two has received tremendous evidential support from science, and mathematics. While it may be difficult to establish the amount of time needed to ensure a reliable trend-line, it seems we have had enough discoveries in multiple fields of study to establish a positively rising trend-line of evidence for Christian theology with multiple valid fields of study. These trend-lines can be difficult to quantify, and therefore, may have higher uncertainty bars due to the qualitative aspects, but the trend remains clear. Especially clear is the trend in the fine-tuning evidence, due to it being quantitative enough that a graph can be produced rather easily. You can track in the scientific literature this trend of increasing established examples of fine-tuned features. While chemist Lawrence Joseph Henderson, in the 1913 book The Fitness of the Environment, was one of the earlier researchers noting the fine-tuning, the tracking of these examples really began in the late 1980s, and the examples have grown from that point. Numerous scientists and works were involved, some samples include Barrow and Tipler’s The Anthropic Cosmological Principle, Gribbon and Rees’ Cosmic Coincidences, and Paul Davies Cosmic Jackpot: Why Our Universe is Just Right for Life. A listing of examples is provided by one who stands in both the science and theology circles often; Hugh Ross is an astronomer, who through his study of astronomy and theology is now also a pastor, and provides the list at the link in the footnote. Attempts to refute examples has consistently led to finding an even stronger example of fine-tuning, or has led to refining the probabilities involved. 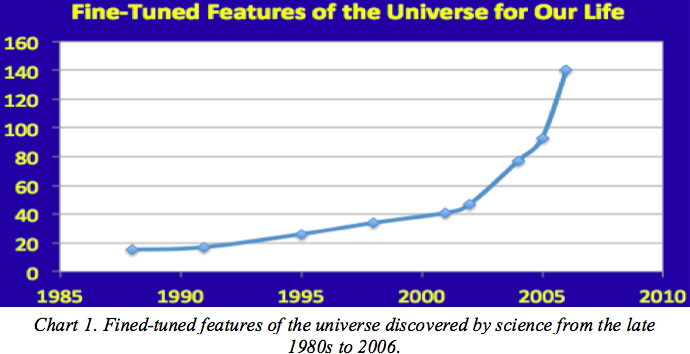 If not for an overload of physics projects at work (or simple laziness), this graph could be updated further, as physicist Luke Barnes, not a theist as far as I am aware, noted that the number of fine-tuning examples in the universe was around 200 in 2011. And, on average, following the scientific literature will provide a new example every month or so. Luke A. Barnes, The Fine-Tuning of the Universe for Intelligent Life, Cornell University Library, 2011. Each of these findings adds to the verification of premise two in the fine-tuning argument, which has implications in theology. Similar graphs can be produced in other fields, and is an opportunity of further study. If a specific theology provides a valid viewpoint of reality, then interactions with other valid fields through time will produce similar trends. In the interaction between history, archeology and the biblical account, the vast majority of apparent conflict has been resolved into phenomenal agreement between the three fields of study, to the point that it would be difficult to find other sources more valuable than the Bible in directing researchers to new discoveries. Examples were noted in the NOMA section of the paper where set theory was discussed. And of course, opposite trends will exist for invalid theologies, or where theologies are mutually exclusive with a valid one. The information is available in other sources, but needs to be organized and updated. Some examples include: 1) nature theologies, which ascribe divinity to things that are a part of nature, such as the storm and fertility deity, Baal, have been progressively discredited as we learn more about nature; 2) pantheist religions, which posit that all of nature is united as divinity, runs counter to modern science discoveries of the universe having a beginning, meaning nature is contingent, or depends on another cause for its existence; 3) the Book of Mormon has numerous claimed revelations concerning the Americas that are historically testable, and these have been roundly falsified; 4) even atheist worldview core beliefs, such as naturalism or materialism, have serious conflicts as knowledge increases within the circle of science and demonstrates that all of nature had a beginning and therefore a cause beyond nature. Platinga further details conflicts between science and naturalism in his book, Where the Conflict Really Lies. This is yet another opportunity for further study, which the SOMA model instigates. Arguments for the different models are useful, to a point, but at some point the models have to “put up, or shut up”, as the verification of predictions will continually flow and deepen the pile of evidence surrounding the accurate model. If either science or a specific theology were false sources of knowledge about reality, then the concordance and mutual support between the fields would be the exception, and overall a trend would develop through time and increased knowledge, which would conform to the pure conflict model relationship. And this is what we do see between science and most theologies. On the other hand, if both sources of knowledge are valid, then the trend would conform over time towards concordance and mutual support. 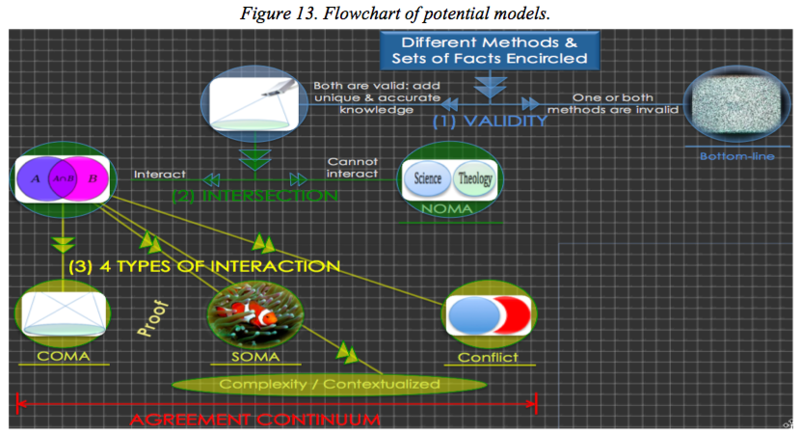 The points in the SOMA model apply to the relationship between any two or more valid sources of knowledge, which reside in the same context as science and theology, and the specific conflicts, supports, trends and relationships espoused in this paper between science and Christianity or other theologies, and the predictions of the SOMA model itself can be dynamically tested by following the evidence as it grows in the involved fields of study. This new model and paper focused upon the relationship between science and Christian theology, which should not be surprising when considering most scholarship in this area, and therefore available data also involves Christian theology. However, this does instigate much further study, as any good model should. Other theologies and worldview beliefs (i.e., atheism, Hinduism, agnosticism, Islam, etc.) should be equally considered and analyzed as was done in this paper. Other questions arise: how much can the trends be displayed and quantified between specific theologies and other fields of study? Over what time frame is enough to demonstrate a significant and reliable trend? How are the predictions of the SOMA model faring? The positives of integrating fields of study were discussed, what about the negatives? When and how would the reality of the SOMA model apply to one’s decision-making process? As watchman of our house of the universe, we can choose to turn off or ignore a camera, if not liking or trusting what it shows. This is beneficial if the view is invalid as it is only noise, but if that camera is valid, providing an accurate view, then we will have purposefully created a blind spot. And if that blind spot is in the area where worldview beliefs are determined, then so many of our thoughts, responses, goals, priorities and directions in life will be impacted. The significance of the topic of this paper, unfortunately, may be experienced by many who created a blind spot, and from that un-illuminated area of the house allowed disastrous consequences to gain entrance. Baker, Joseph. “Public perceptions of incompatability between science and religion,” Public Understanding of Science, 21 (3), 2012: 340-353. Barbour, Ian. Religion and Science: Historical and Contemporary Issues. San Francisco: Harper, 1997. Barrow, John and Frank Tipler. The Anthropic Cosmological Principle. Oxford: Clarendon Press, 1986. Brooke, John H. Science and Religion: Some Historical Perspectives. Cambridge University Press, 1991. Craig, William Lane. “What is the Relation between Science and Christianity”, Reasonable Faith, (Retrieved 3/2/2015). Dalai Lama. “The Universe in a Single Atom: The Convergence of Science and Spirituality.” Broadway, 2005. Dixon, Thomas, Geoffrey Cantor, and Stephen Pumphrey. Science and Religion: New Historical Perspectives, Cambridge University Press, 2010. Ecklund, Elaine Howard. Science vs. Religion: What Scientists Really Think. New York, NY: Oxford University Press, 2010. Ecklund, Elaine Howard, and Jerry Z. Park. “Conflict Between Religion and Science Among Academic Scientists?”. Journal for the Scientific Study of Religion 48 (2), 2009. Ferngren, Gary, ed. Science & Religion: A Historical Introduction. Baltimore: Johns Hopkins University Press, 2002. Gould, Stephen J. “Dorothy, It’s Really Oz”, Time 154, 1999. Harrison, Peter. The Cambridge Companion to Science and Religion. Cambridge, 2010. Hoyle, Fred. The Nature of the Universe, second edition. Oxford: Basil Blackwell, 1952. Jastrow, Robert. God and the Astronomers. W. W. Norton & Co. Inc., 1992. Larson, Edward J., and Larry Witham. “Scientists are still keeping the faith”. Nature Vol. 386, 1997: 435 – 436. Larson, Edward J., and Larry Witham. “Leading scientists still reject God”. Nature, Vol. 394, No. 6691, 1998. McDowell, Josh. New Evidence that Demands a Verdict. Nashville: Thomas Nelson, 1999. National Academy of Sciences, Institute of Medicine. Science, Evolution, and Creationism. National Academies Press, Washington, 2008. Norris, Pippa, and Ronald Inglehart. Sacred and Secular: Religion and Politics Worldwide, second ed. Cambridge University Press, 2011. Numbers, Ronald, ed. Galileo Goes To Jail and Other Myths About Science and Religion. Harvard University Press, 2009. Platinga, Alvin. Where the Conflict Really Lies: Science, Religion, and Naturalism. Oxford University Press, 2011. The Pew Forum. “Science in America: Religious Belief and Public Attitudes”. 18 December 2007. Polkinghorne, John. Science and Theology. SPCK/Fortress Press, 1998. Polkinghorne, John, and Philip Clayton, ed. The Oxford Handbook of Religion and Science. Oxford University Press, 2006. Principe, Lawrence M. Science and Religion. The Teaching Company, 2006. Richardson, Mark, and Wesley Wildman, ed. Religion & Science: History, Method, Dialogue. Routledge, 1996. Ross, Hugn. RTB Design Compendium. Reasons to Believe (Retrieved 3/2/2015). Russel, C.A., and Gary B. Ferngren, ed. Science & Religion: A Historical Introduction. Johns Hopkins University Press, 2002. Stace, W. T. Time and Eternity: an Essay in the Philosophy of Religion. Princeton University Press, Princeton, NJ, 1952. Stenger, Victor J. God and the folly of faith: the incompatibility of science and religion. Amherst, N.Y.: Prometheus Books, 2012. Stump, J.B., and Alan G. Padgett, eds. The Blackwell Companion to Science and Christianity. Malden, MA: Wiley-Blackwell, 2012. Tipler, Frank J. The Physics Of Christianity. New York, Doubleday, 2007. Tyson, Neil deGrasse. Natural History Magazine, October 1999. Vilenkin, Alexander. Many Worlds in One. New York: Hill and Wang, 2006.